I’m also kicking off 18 (yes, 18!) giveaways today. I hope they’ll serve as a small thank you for reading every day and shopping through this site… and I also hope that they’ll make things a little more entertaining over the next few weeks. :) So here’s the deal: I’m giving away $50 (payable via Paypal or Venmo) every day until the end of the sale on August 5th. And then on August 5th, I’ll give away a $300 grand prize. 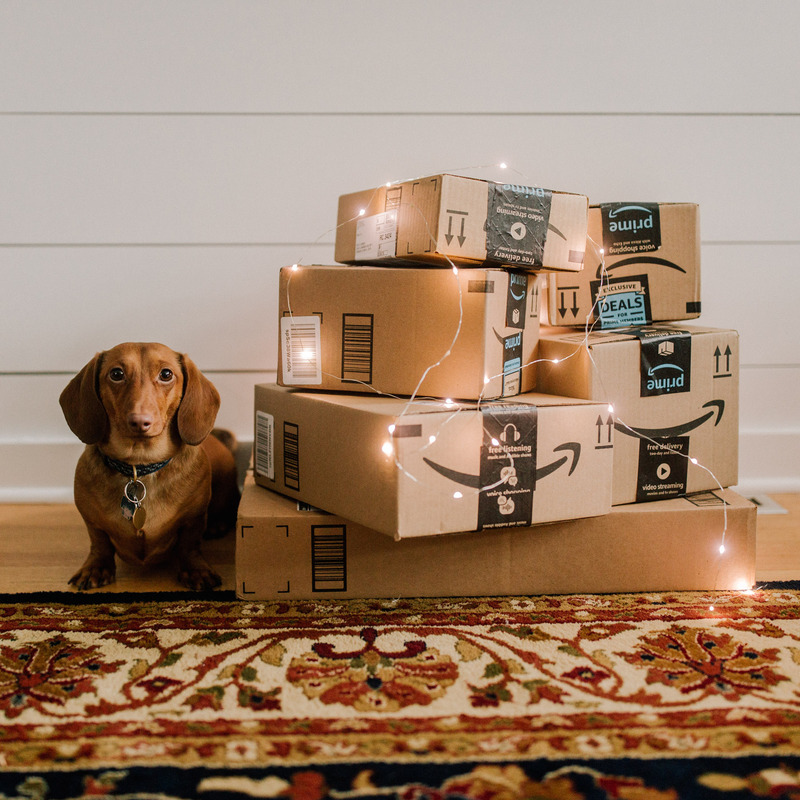 It goes without saying that you can use the money to shop the sale guilt-free… or, instead, do whatever your little heart desires with it. ;) I’d personally use the money to buy a new hard drive because MINE ARE ALL FULL AND IT’S SO ANNOYING. But that’s just me, and a story for another time. Simply comment in the comment section at the end of the daily blog post. While we’re going to try to have a question up every day, say whatever you’d like if you don’t see one, haha. (#disorganized) But be sure to leave your email address in the following non-spammy format so Mitch can get in touch with you: kelly [at] kellyinthecity [dot] com. (Yes! Mitch has volunteered to randomly select and pay every winner every day. Thanks, Mitch. So if you see an email from Mitch@kellyinthecity.com, don’t delete! It means you’ve won.) Congrats to Lauren V., Maggie P., and Kaitlin M. for winning the last three giveaways. Here’s today’s giveaway question: What’s been your favorite moment of this summer so far? On to my sale recs! Totally forgot to add this one, so here’s a midday update to my post. :) It’s so sweet, right?! And it’s made out of polyester so it doesn’t wrinkle easily. (That’s a theme in this guide — haha — HATE pieces that wrinkle easily.) It comes in three colors, too, which is lovely. As for sizing, I’d say it’s generous. I’m wearing a 0 here, which is what I’d normally choose, and It’s on the looser side. So depending on how you like your dresses, either order your usual size or go down one. YES! I absolutely love this one so I thought I’d start out with it. I actually already owned it in the vest version, and really wanted to try the pullover, as I’d never seen it before. It’s WONDERFUL. 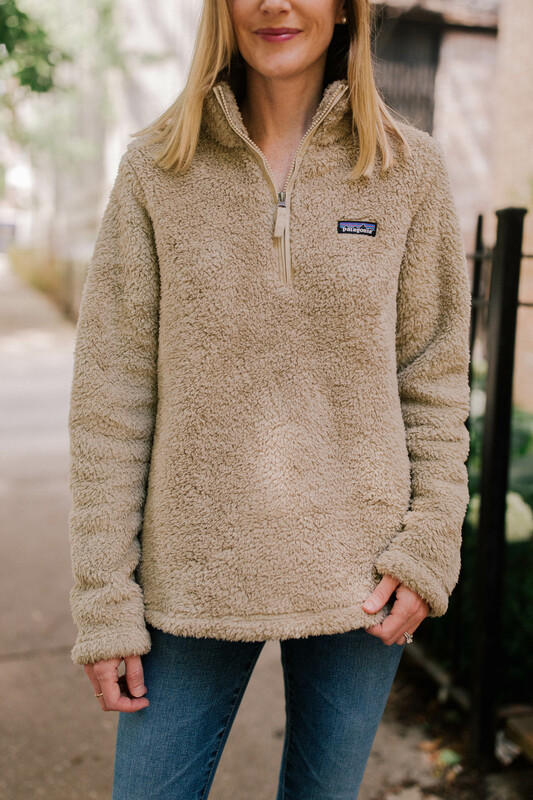 Super soft and cozy. I’d say that it runs on the smaller side. I’m wearing a size medium here, and while it’s a little loose, it’s just how I like it. (I do think, however, that a small would have fit, too.) I highly recommend! The sweetest. 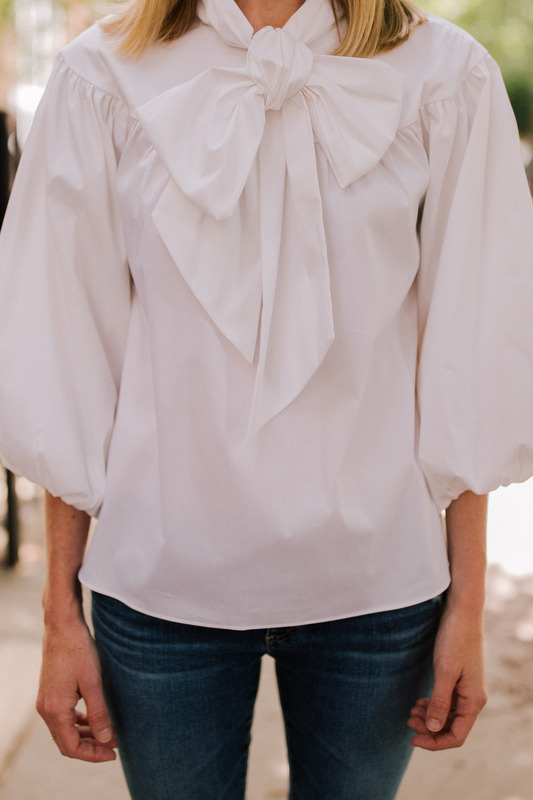 It comes in a bunch of colors, and I can’t get enough of that ruffled neck. I’d say that the sizing is generous. I’m wearing a medium here, but I would have ordered a small. (Bought it in-store, and medium was all I could find.) Love tucking it into one side of my jeans to give myself some shape! But could also see myself wearing it with leggings during the winter. COZY! An absolute favorite from the sale. 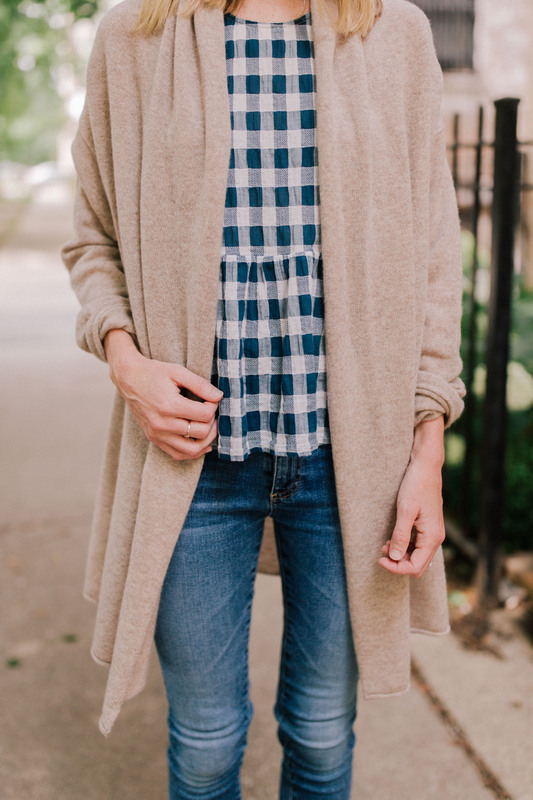 I think it’s such a statement piece, yet it’s cozy and totally something you’d wear multiple times per week in the fall and winter. It’s one-size-fits all, and I love that. 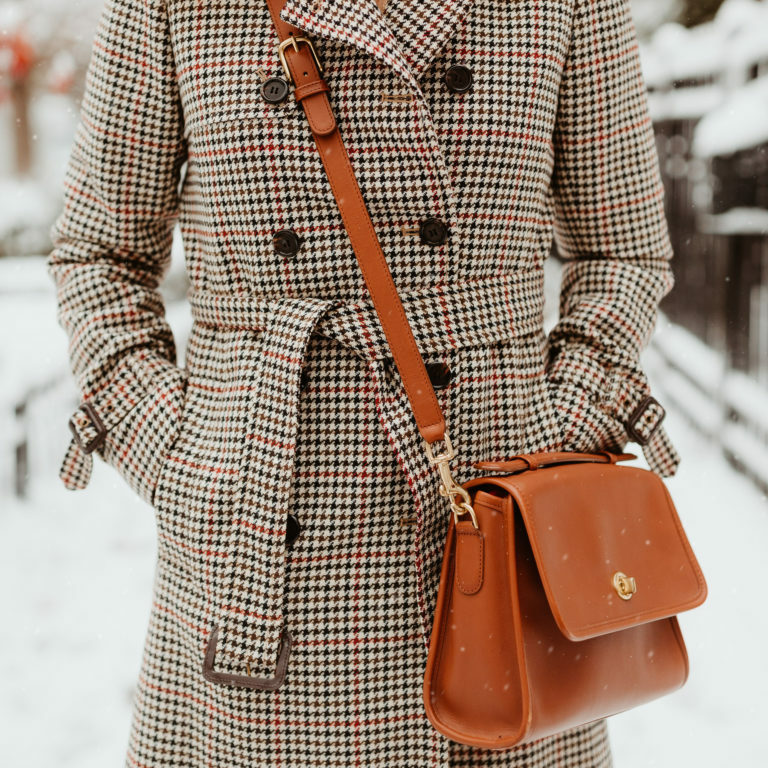 I’m actually featuring quite a few one-size-fits-all products in this post, and I think they’re awesome for several reasons. Keep reading, haha. 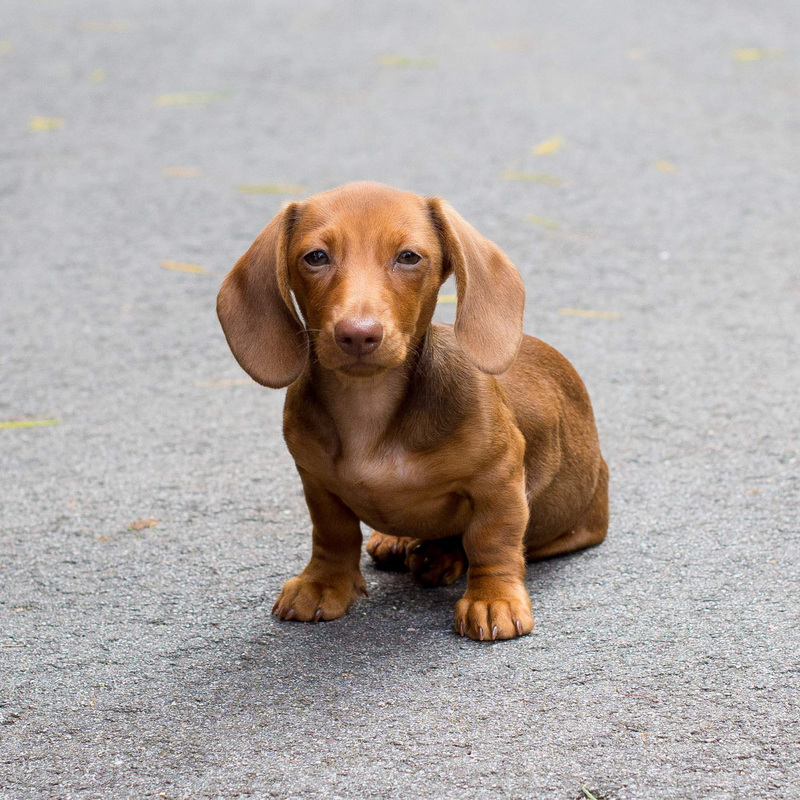 Hello, cuteness. 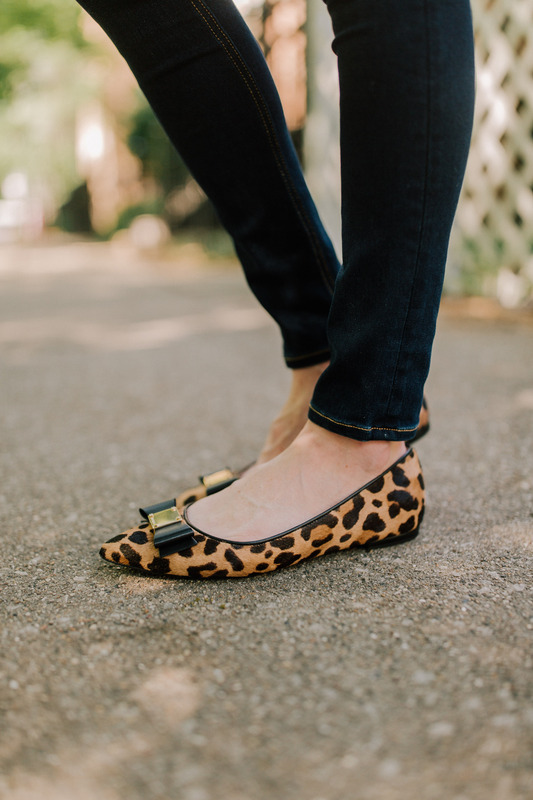 Every girl needs a great pair of leopard flats for the fall, as leopard is essentially a neutral. ;) Any other Jenna Lyons fans out there?! Anyway, I love these shoes. They’re padded on the inside, which provides extra comfort, and they fit wonderfully. Walked a mile in them this past week and they were great! They come in a solid version, too. And here are the pumps! I don’t know why every company doesn’t put out a bunch of camel coats every year, as they’re insanely functional and popular. I feel like they sell out so quickly every year, and then they’re so hard to find! Sizing: It runs on the larger side. I’m wearing an XS and it’s generous. (Though I don’t feel like it’s swallowing me.) I’d recommend order your regular size or one size down. This is another sweater I adored. I could only find it in a medium, so that’s what you see here. But I would have gone with a small if I’d been able to find one in store. I’d say it runs totally TTS. Cute features: the scalloped neckline and the fluted sleeves. Very soft and certainly something you could wear to work. Here’s the other scalloped option, which I bought last year! And here’s my bag, in case you’re wondering about that. Go up a half size. Other than that, these are perfect and are, without a doubt, my favorite shoe purchase from the sale. Don’t they look just like the Prada version?! I actually don’t know what I’m talking about, haha… but I think there’s a classic Prada shoe that resembles this. Super comfy and easy to keep on my feet, and you can’t beat the price. They come in leopard, too. I’m wearing a small here, which works well. I’ll admit that it doesn’t make you look thinner, but the coziness factor makes up for it. It sells out quickly so get it while it’s still in stock! LOVE. For the purposes of reviewing it and featuring it over these next couple of weeks, I bought it in both the light pink and the brown colors. I can’t decide which I like better! I’m a huge fan of how many pockets it has. 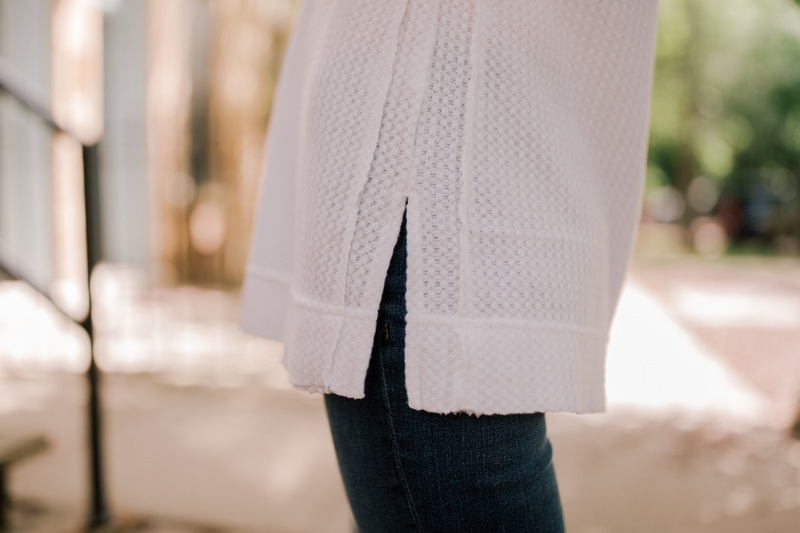 There’s a large zippered pocket that runs across the middle dividing it into two parts, and then there’s a zippered pocket on one side and a couple of open pockets on the other. I also love the length of the straps. As you can see, I can get it over my shoulder–even when I’m wearing a jacket–without an issue. 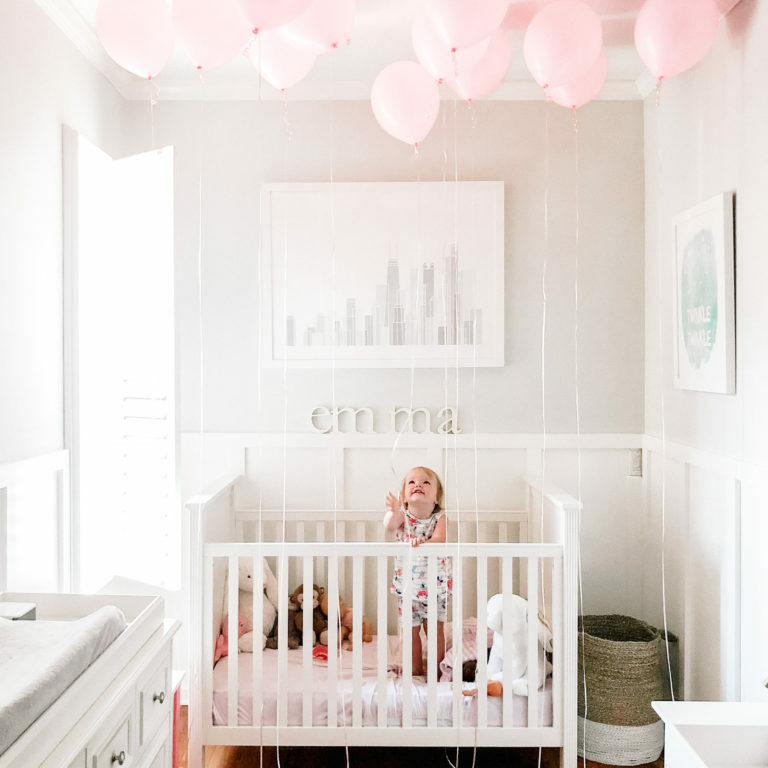 And when I pick Emma up, it doesn’t slide around and hit her in the face. (Added bonus. 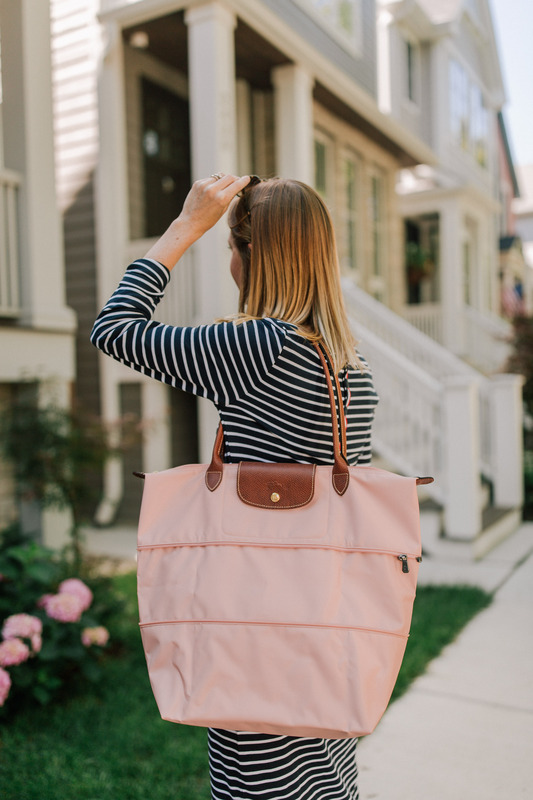 ) If you need a bag that’ll bring you from day to night (especially during the work week), this is a GREAT option. Here’s the mini version. I really can’t believe this guy is included in the sale. I finally have my own (which is an older, hooded version), as I used to borrow my mom’s when I was down the Shore in the colder months. It’s unbelievably light and soft, yet super warm. 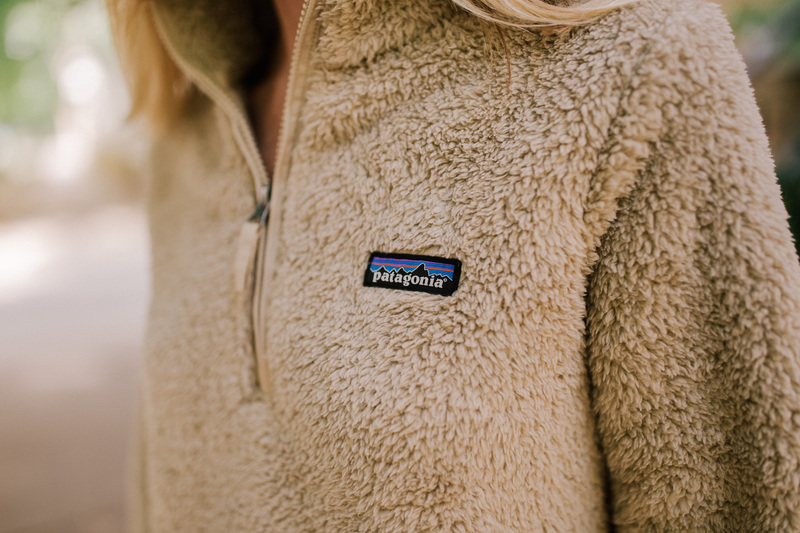 Patagonia runs small. While I usually wear a size XS in jackets, I’m wearing a size small here and it’s just right! My best recommendation is to go one size up. Pretty sure the current version is the same as mine, only sans hood. Love this one, too. (Btw: my top is old from Tuckernuck. Sorry about that.) It’s one-size-fits-all, which is fabulous, as you really don’t need to stress over what size to go with. It says it fits sizes 4 through 12, but I’m on the smaller side and I love how it looks on me. I wouldn’t say that it’s the softest cardigan I’ve ever owned, but it’s also not rough or itchy at all. 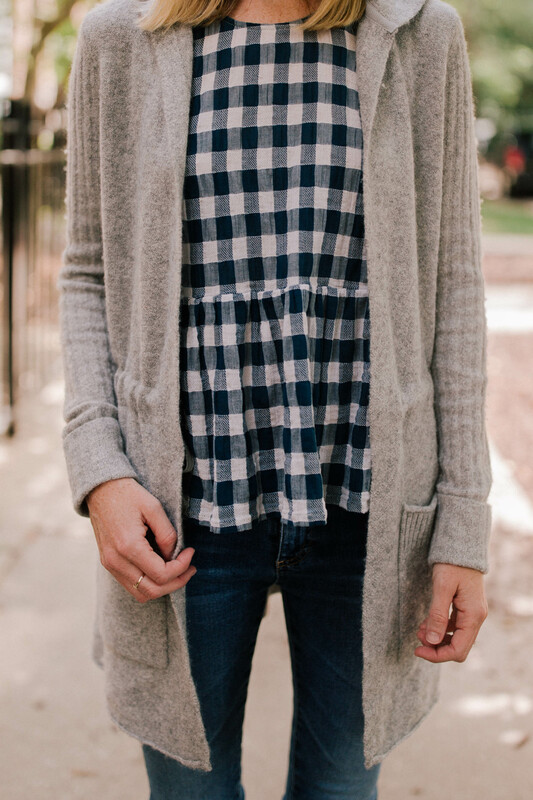 Love that it has pockets and that it looks adorable with its sleeves scrunched up. My favorite jeans from the sale. I don’t love high-rise jeans, but low-rise jeans give me trouble at the playground. ;) These are the perfect compromise! They are incredibly soft, they fit like a glove, and I didn’t have to get them hemmed. As you can see, they are just right for my height. (I’m between 5’4 and 5’5.) Another bonus is that they don’t bother me at the waist, as most jeans do. I can’t with these jeans. They’re INCREDIBLE. Read my full review here… but trust me. You need them. Just the right amount of stretchiness without stretching OUT, and very soft. And no muffin top. 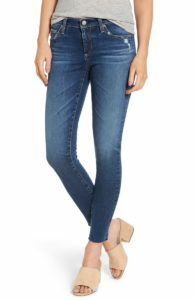 AG jeans almost never go on sale, and this particular pair sells out quickly. So jump on this deal if you can find them in your size! They run TTS. I’m wearing a size 25, which is my normal size, and they fit perfectly. Can’t say more about this sweater! I bought it when I was out in Denver last year, and I fell head over heels in love with it. 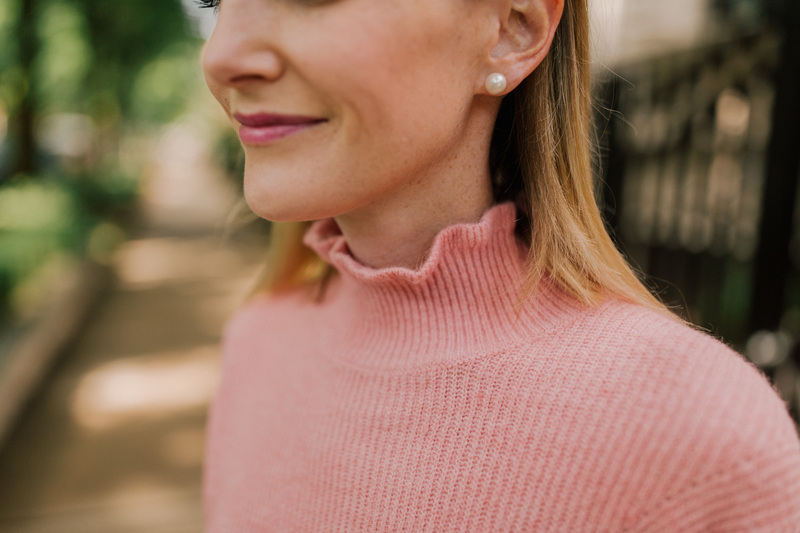 The price is incredible for cashmere, and I adore the little bows at the sides. It comes in so many great colors, too. (Though I don’t think in the blush anymore.) I mentioned this before, but I almost always go up a size in sweaters because I love the look of slightly oversized tops and sweaters with tight skinny jeans. I’m wearing a size small here, and it works so well! If you like your clothing a bit more form-fitting, though, order your usual size. SO CUTE. I was drawn to this one immediately when the sale started. I’m wearing a size 2 in it, which is what I normally go with in skirts. It’s good, but I think I could have gone up to the size 4, too. (That was confusing. Haha. But basically, order your regular size or one size up, depending on whether you like your skirts to fit higher on the waist or lower.) Btw: I LOVE it in red, too. In houndstooth here, and in floral here. SO SOFT. 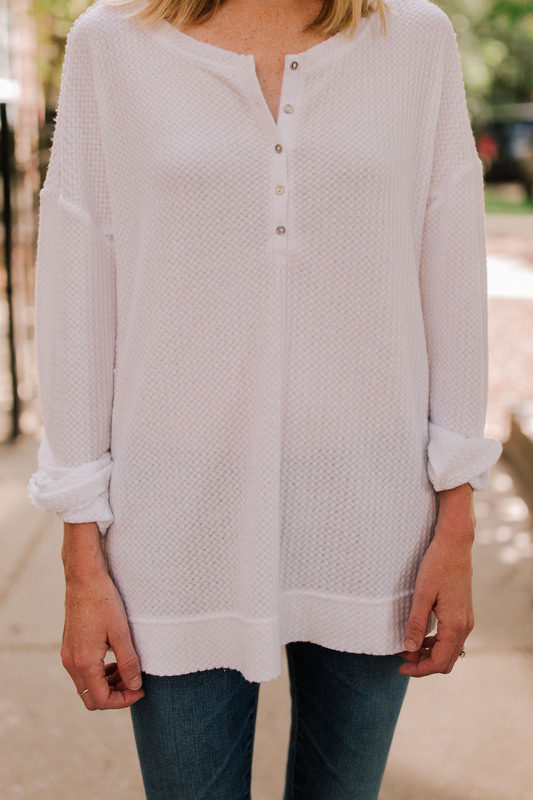 This is obviously a weekend shirt, but it’s dreamily cozy. Disclosure: I’m wearing a size medium here because it’s all I could find in the store, but I definitely would have gone with the size small if I’d found it. (Hoping it’ll just shrink in the wash.) It’s on the roomier side. Without a doubt, these are the comfiest Tory Burch flats I’ve ever tried. I don’t know about you guys, but I’m still kind of scarred from the old design of the Tory Burch Reva flats. AWFUL. At least for me, they were. So painful, and I was always walking out of them. 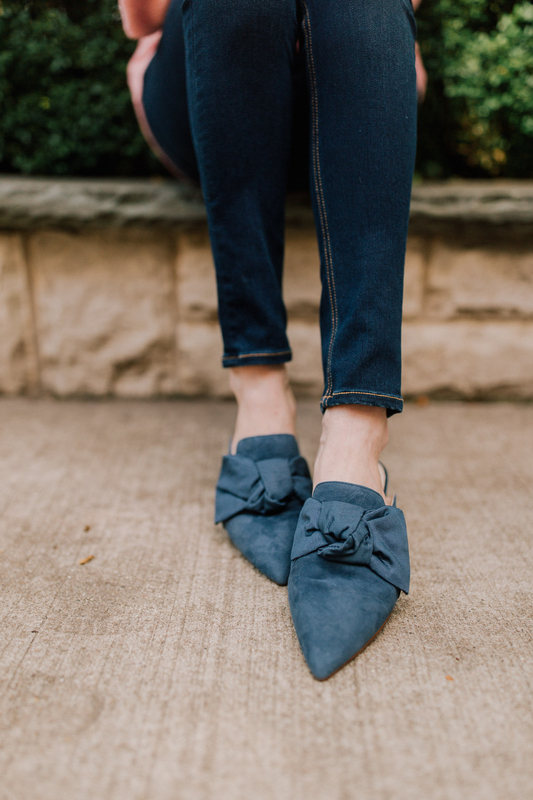 The sale flats, however, are buttery soft and stay on my feet without an issue. Here are the pumps! Both versions run totally TTS and are insanely comfy. (I took mine in a 7.5, which is what I normally wear.) 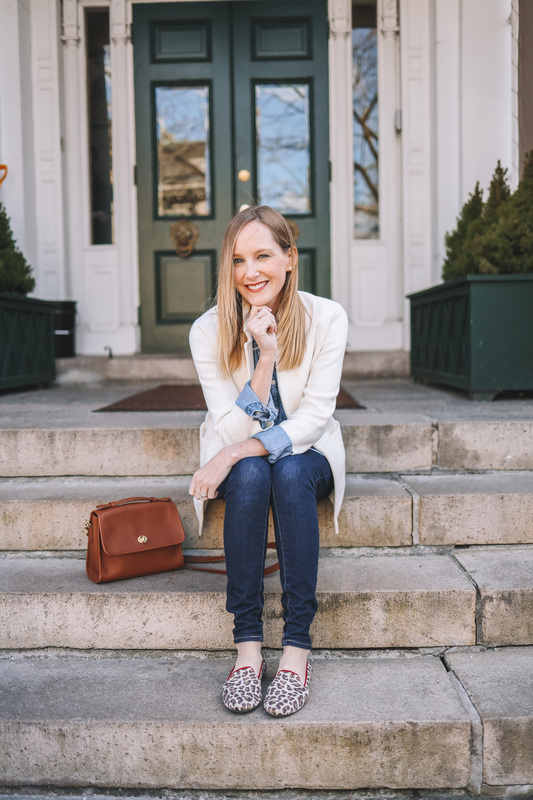 I wore the flats downtown recently and no pain! This one stood out to me as a favorite. 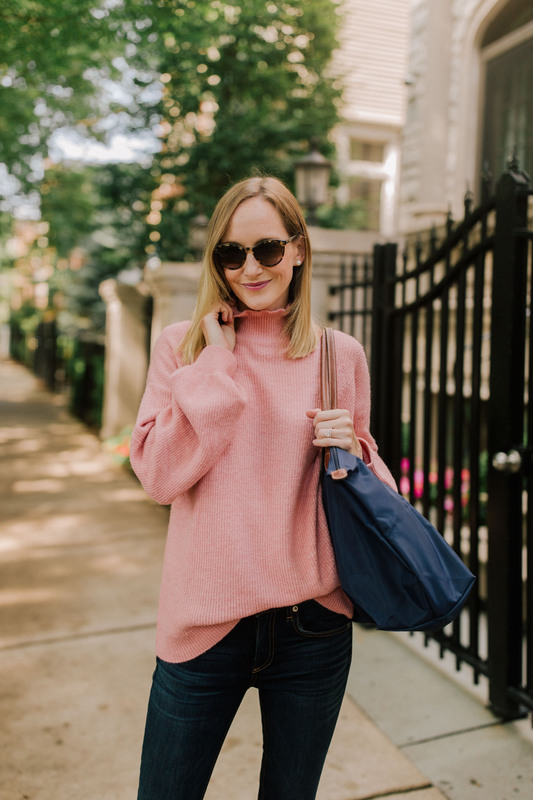 Halogen cashmere sweaters are AMAZING, and I own many. This one is also one-size-fits-all, which is a new-to-me thing that I love. So great for gifts, right?! And you just don’t need to worry and wonder whether you’re ordering the right size. 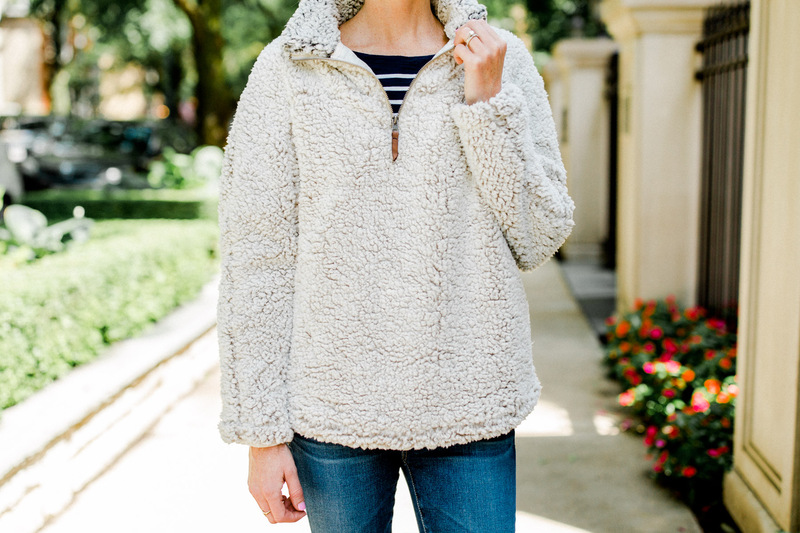 It’s incredibly soft, cozy, and goes with everything. And it comes in a ton of colors. Winner, for sure. 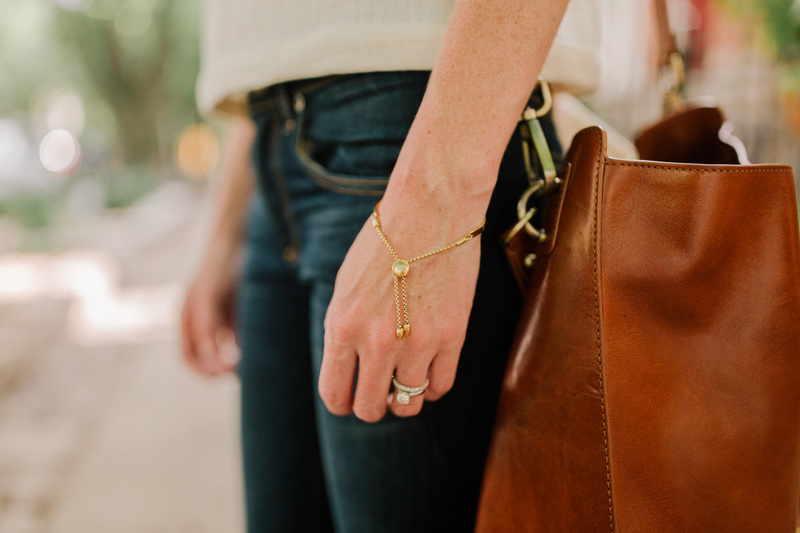 The above pair isn’t the Halogen version, but everyone needs a pair of leather leggings for the fall! This is a wonderful price, so don’t miss ’em. They run a bit small so size down. I’ve owned this one for over a year now, and I can’t recommend it more. I also have it in the ivory color, in case you remember that from last year! 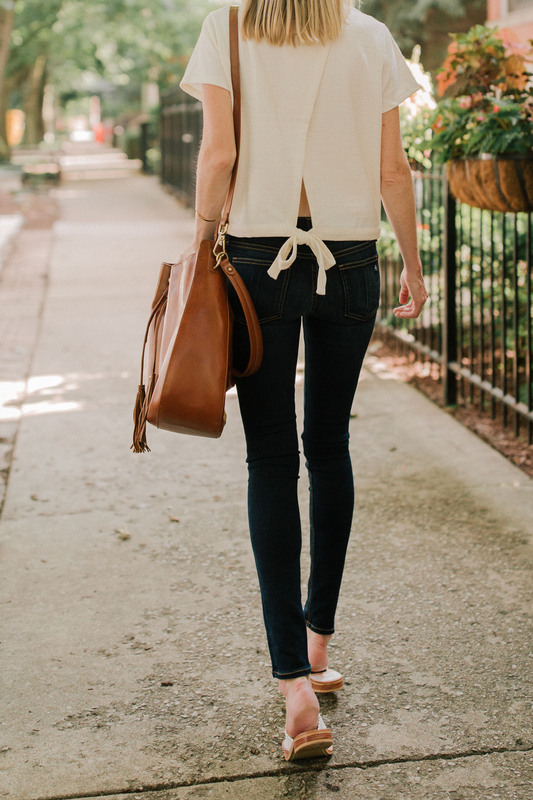 It’s soft, has pockets, and cinches around the waist to give you a little more definition. (Think that feature is just really cute, too.) And love the hood. I’m wearing it here in a size XS. I’d say that it runs TTS; order your normal size. It was love at first site when I saw this one. It screams Kelly Larkin. ;) The navy stripes?! The buttons down the back?! The midi cut?! The sleeves?! It was a no-brainer, for sure. I also love that I can wear the dress now, but also well into the fall. It’s a classic! And it’s 100-percent coming with me to Martha’s Vineyard and Nantucket! 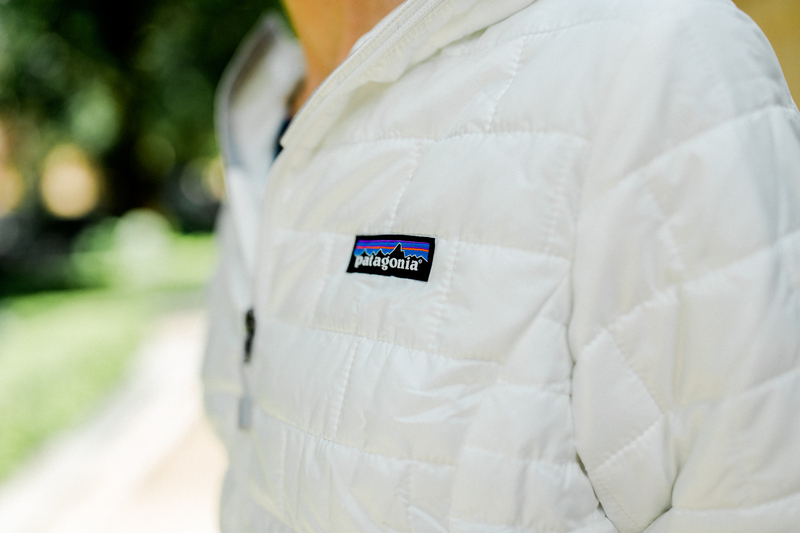 I found that it’s lightweight enough to stay cool throughout the day, but then substantial enough to provide some coziness for chillier nights. A note about sizing: I would go up one size in this. I almost always wear an 0/XS in dresses since I have a small frame, but I definitely needed to size up to the small. Granted, I tend to like my clothing a little looser, but friends who have the dress agree that it runs a little small. 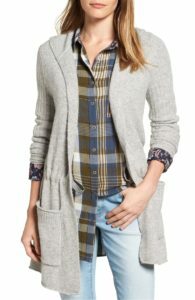 Btw: 1901 (Nordstrom’s preppiest line) has a ton included in the Anniversary Sale right now! 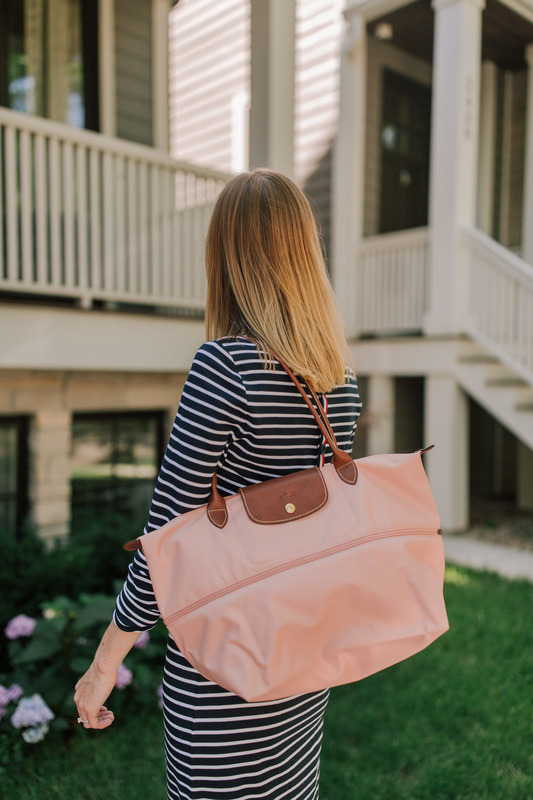 My thoughts on the tote is that it’s a fabulous travel bag. I don’t know about you guys, but I always leave for trips with a reasonable amount of stuff in my tote and return with it overflowing.  SO NICE that it expands to just about double its zippered size for occasions like this. Basically, it’s the Disorganized Girl’s dream bag. 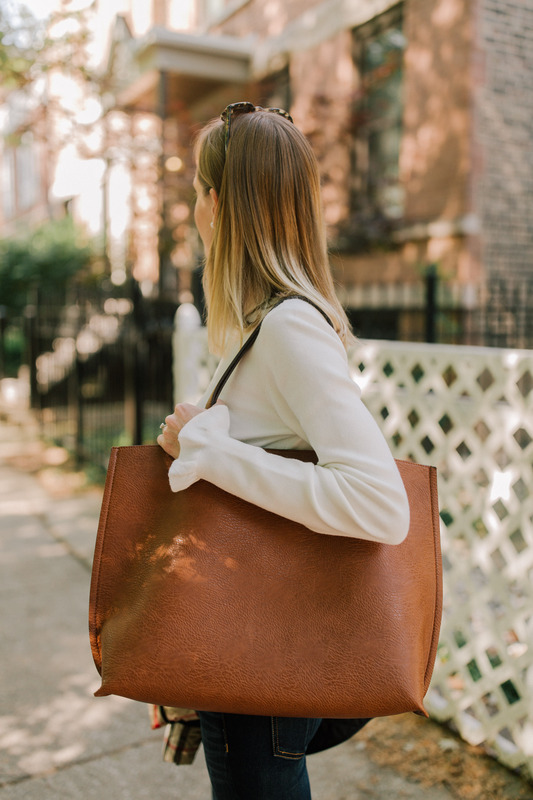 Side note: this leather version of the bag is part of the sale, and it’s a dream if it’s within budget. And this is the backpack I use when I want to be hands-free with Emma. It’s awesome! Holds a lot. 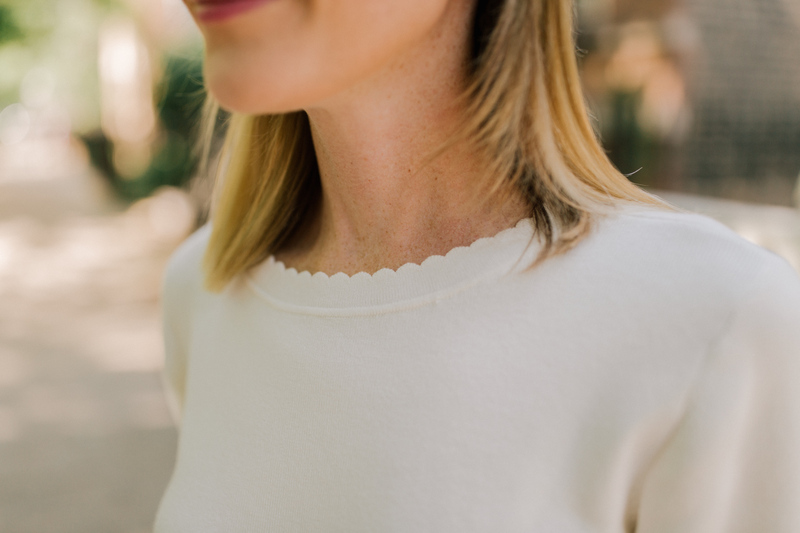 I love the tie-back feature on this top, as the name of this top suggests! Two things: You can totally wear a normal bra with it, which is GREAT. (I’m wearing one in the above photo.) And you should size up. I went up to a medium and it’s just right. Click here to see more pics. The best part about this bracelet is that if you bring it into Nordstrom, they’ll engrave it for you for free. My brothers and I gave a similar version to my cousin this past year when she was fighting a tough battle, and I hope it brought some comfort. My parents also gave it to my sister-in-law when she graduated from medical school! 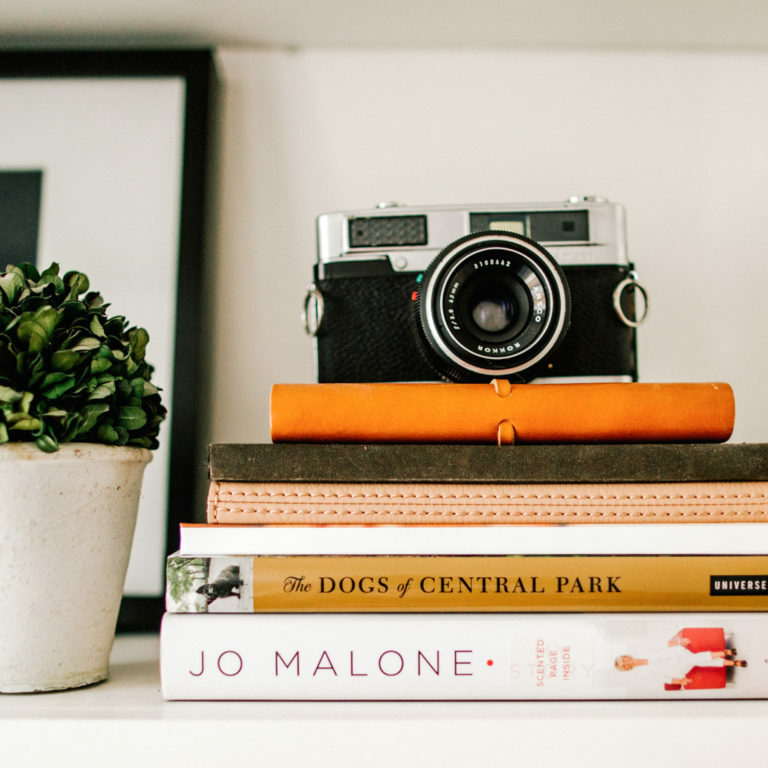 You can engrave anything on it, and I love the sentimental possibilities. YES. Friends, the Barefoot Dreams collection lives up to the hype. 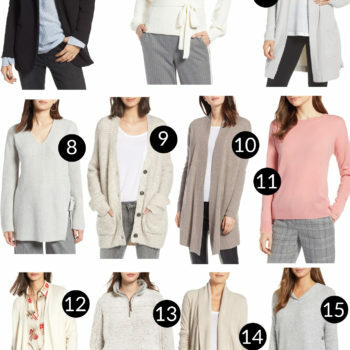 They are BY FAR the coziest, softest sweaters I’ve ever owned (literally zero itch), and I can’t recommend swooping one or two up right now, since they’re marked down. The one I’m wearing in this photo has a wrap feel to it, and I like the fact that it doesn’t have a hood. (Makes it a little dressier.) The hooded version in gray, though, is definitely my favorite. It’s a little thinner but I just think it’s going to go with so much this fall, and will accompany me on nearly every trip to the playground. 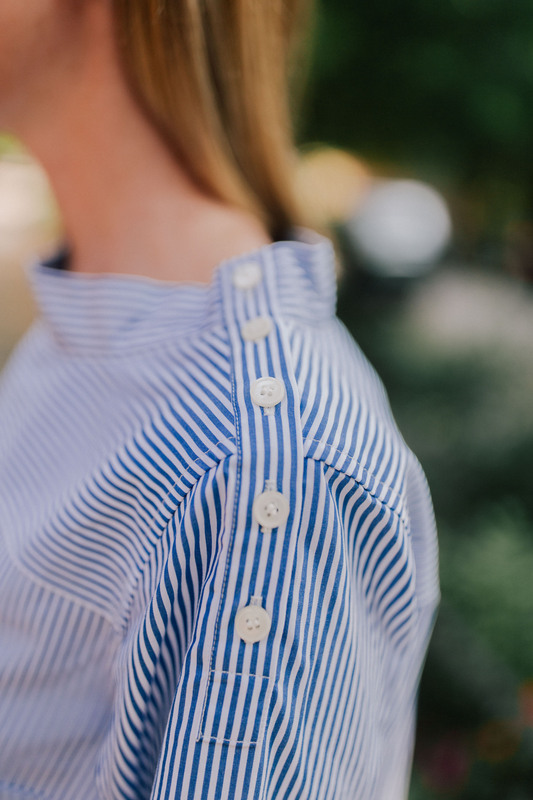 (So cute over a button-down, right?!) I’ll admit that I also have the more substantial cardigan, which is what I reach for at night. It’s my cozy, hang-on-the-back-of-the-office-door sweater. It’s a little bulkier but all the more cozy because of it. All the same qualities as the one above this, but a bit more substantial. Also has pockets. Love this color, too! Runs large. I went with the S/M and it’s roomy. In a great way! 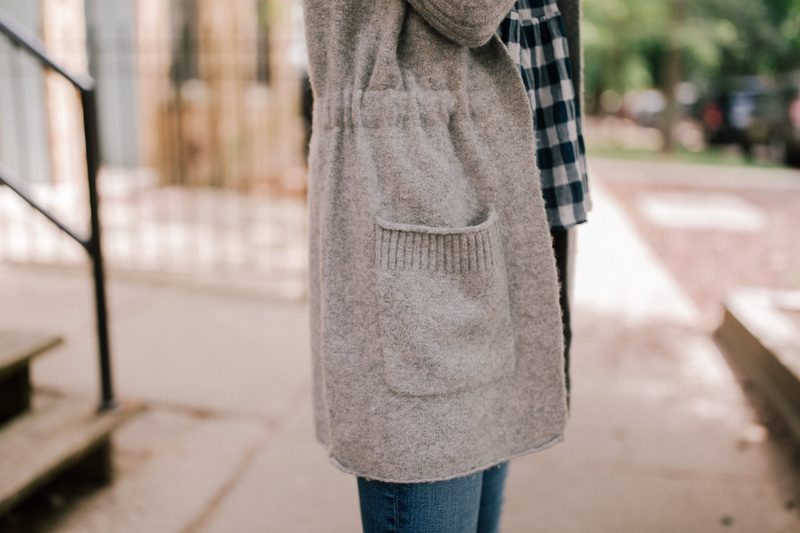 Again: out of all three, I’d say that this is my favorite Barefoot Dreams cardigan. The most versatile, the best weight, and the one I grab for the most often! I ordered my usual size and it’s fantastic. (In solid here. J.Crew also carries it.) I’m just going to leave this here: whenever I wear this top, I get SO many compliments on it and questions about it. I actually don’t think I did a great job of photographing it; it’s far more flattering in person! You do need to iron it, but it’s worth it. I’m wearing a size 0 here. I’d recommend ordering your normal size. Another amazing find! 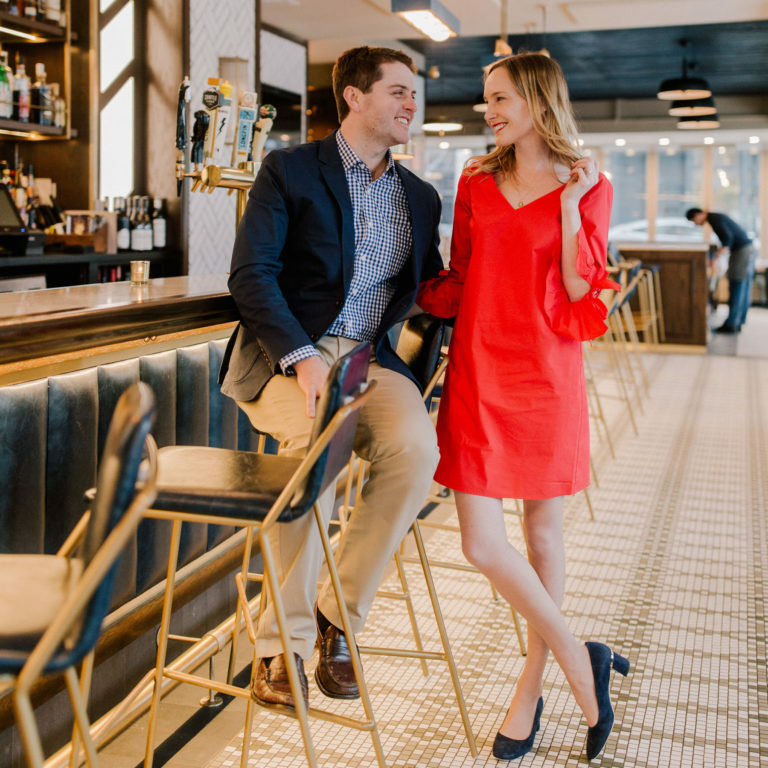 I have an older navy J.Crew blazer, but I’ll admit that I don’t love it because it has shoulder pads and has a boxy look to it. This one is great, though. It’s 64 percent polyester, 31 percent viscose, and 5 percent elastane… so it’s wrinkle-resistant and flattering. I love that it dresses up a casual outfit and provides some warmth, too. 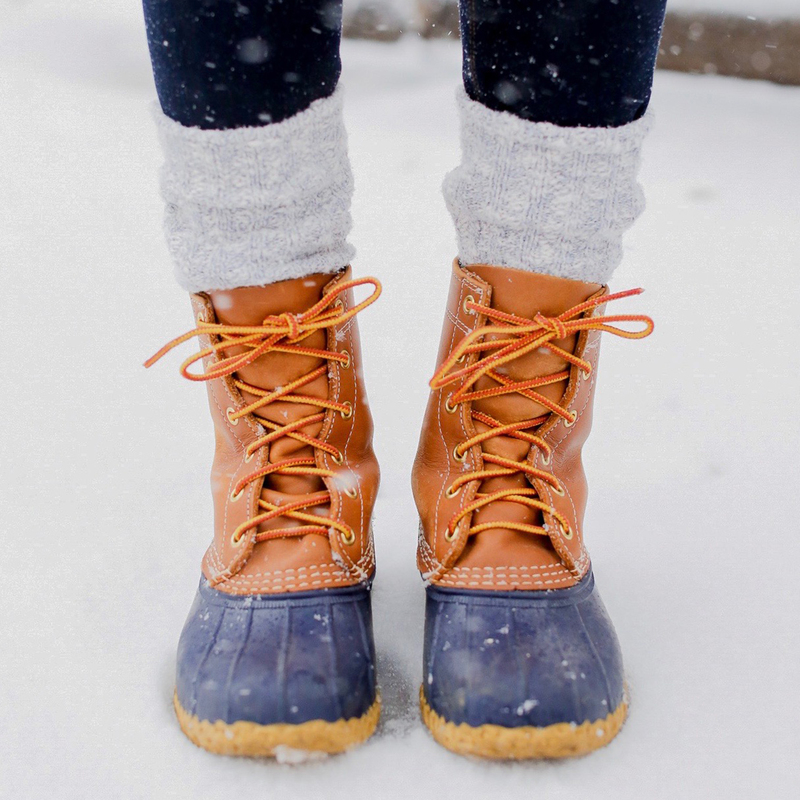 Great for the fall, but also year-round. I find that J.Crew blazers run a little small in the shoulders so I went up one size. I’m wearing a 2 here. 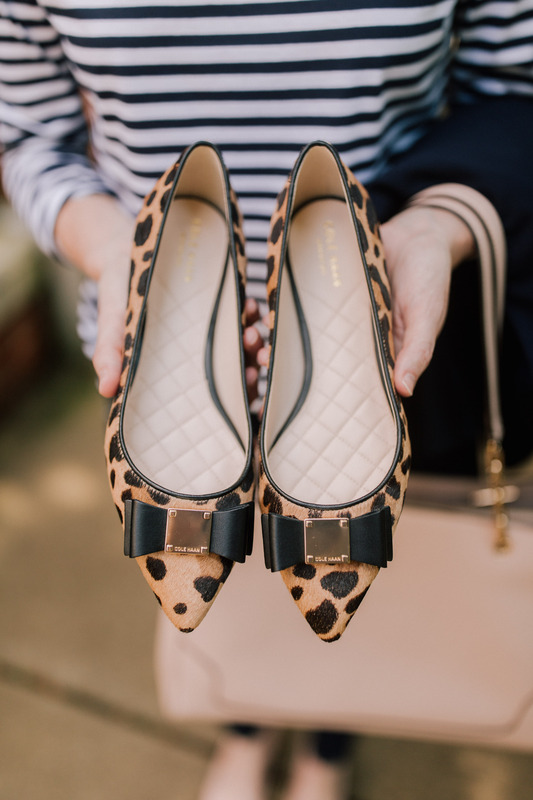 In my cart: these leopard bow flats, these camel pumps I think will go with everything, and either these TB flats or these TB pumps. CAN’T DECIDE. I also have these waterproof leather boots and they are life. GET THEM. So comfy. 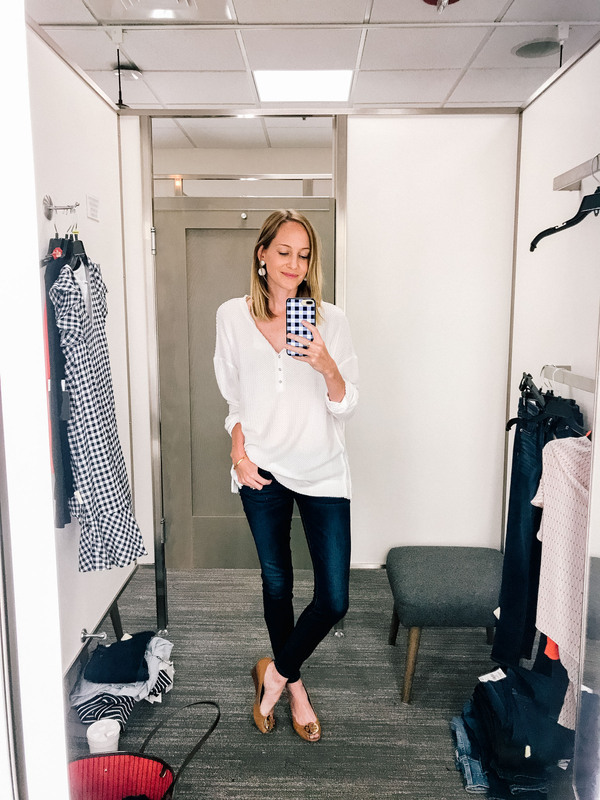 These Jacks aren’t technically part of the Anniversary Sale, but they’re majorly discounted, and you don’t need the Nordstrom credit card to shop ’em! In my cart: Definitely this pair by Paige, this pair by Rag & Bone, and this pair by AG. <–already own them and they’re the BEST. 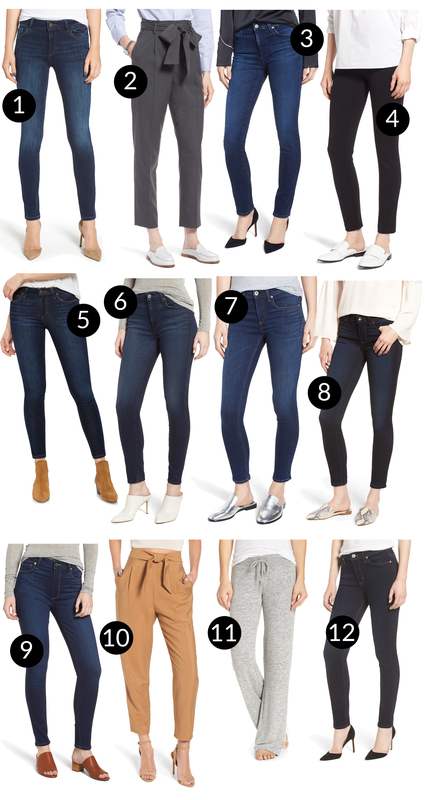 These jeans deserve their own highlight because they’re AMAZING! I’ve owned mine for a year, and they’re my most worn pair. They run totally TTS, btw. I took them in a 25, which is what I normally wear. These too! Have them and adore them. 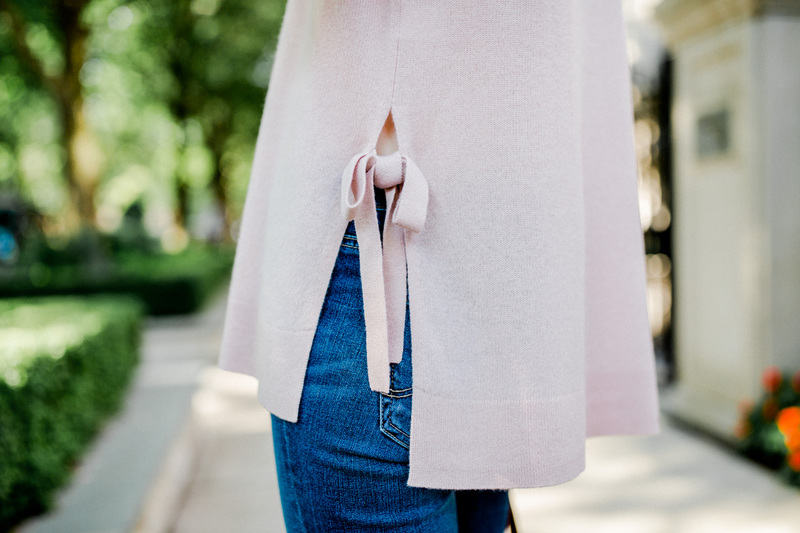 In my cart: This ruffled coat, this pullover (size up! ), and this camel coat. 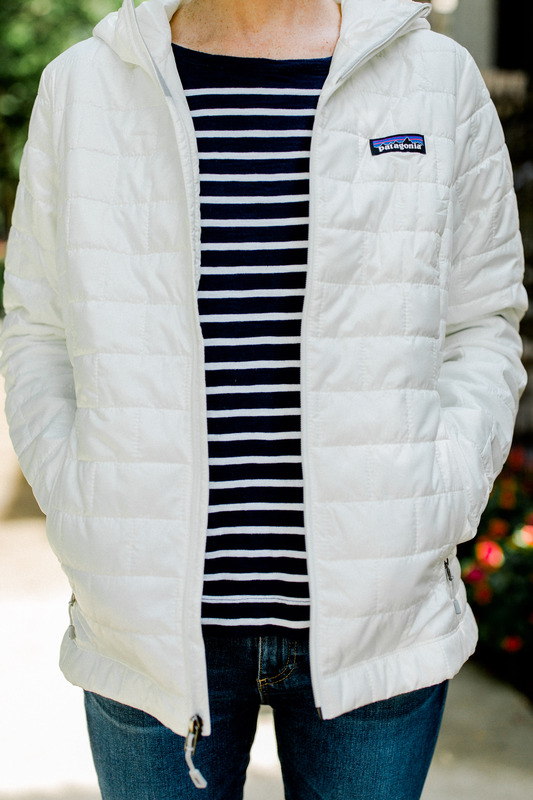 This jacket, which I own, is also on sale! Super lightweight and packable. I love it in black. I have it in a size small. 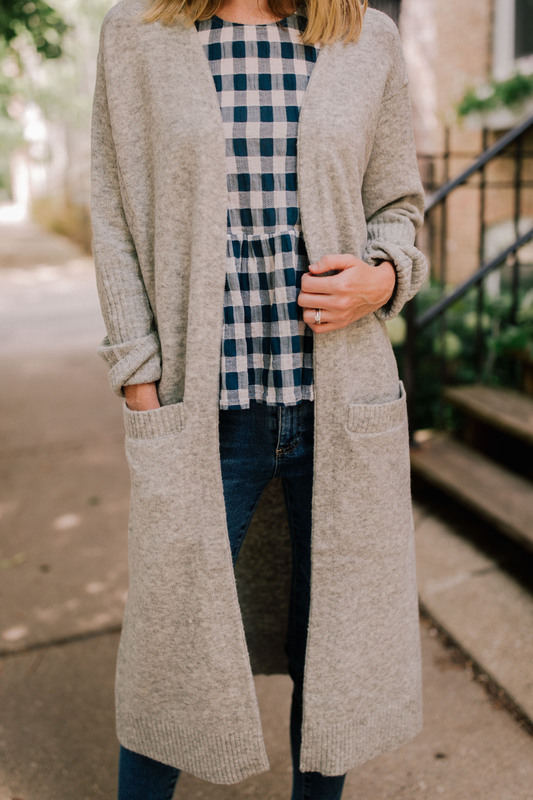 In my cart: This Barefoot Dreams cardigan because everyone says it’s AMAZING, this drawstring sweater (OMG), and this long sweater vest. 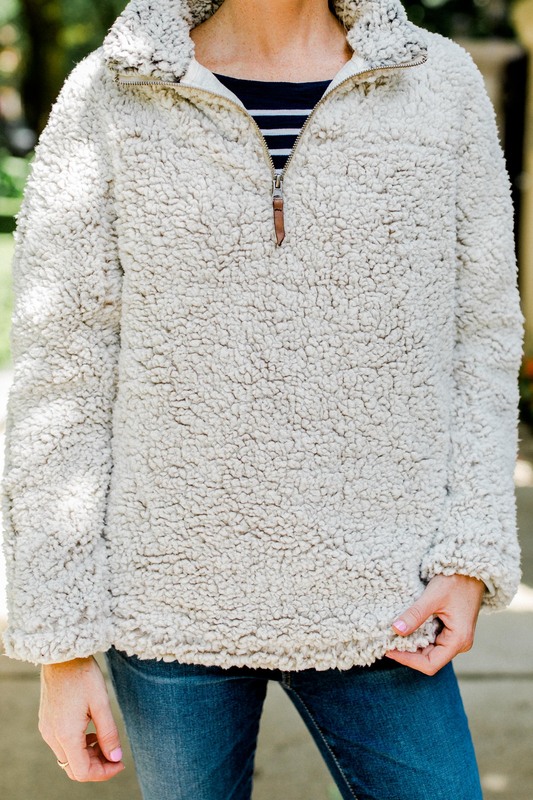 I also already have this Wubby pullover and let’s just say you NEED it! This one also deserves its own spotlight! It’s a fave. 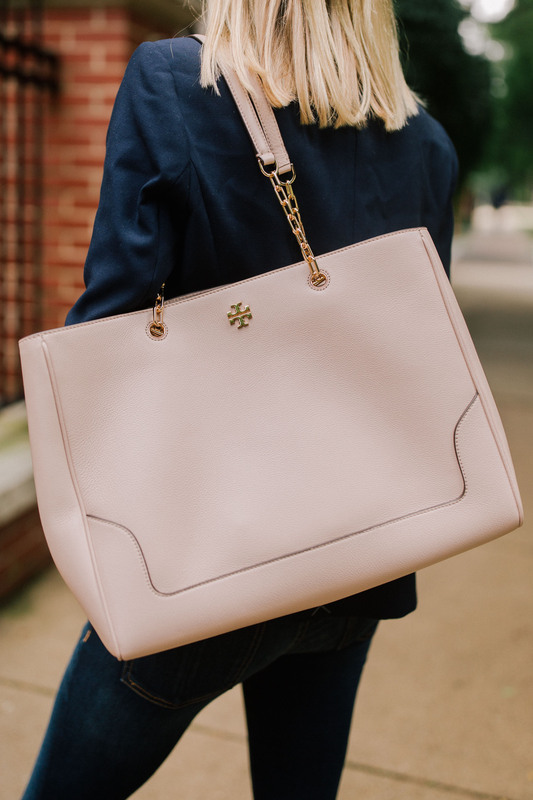 In my cart: This Tory Burch tote, this Longchamp bag, and I already have this bracelet and wear it constantly! 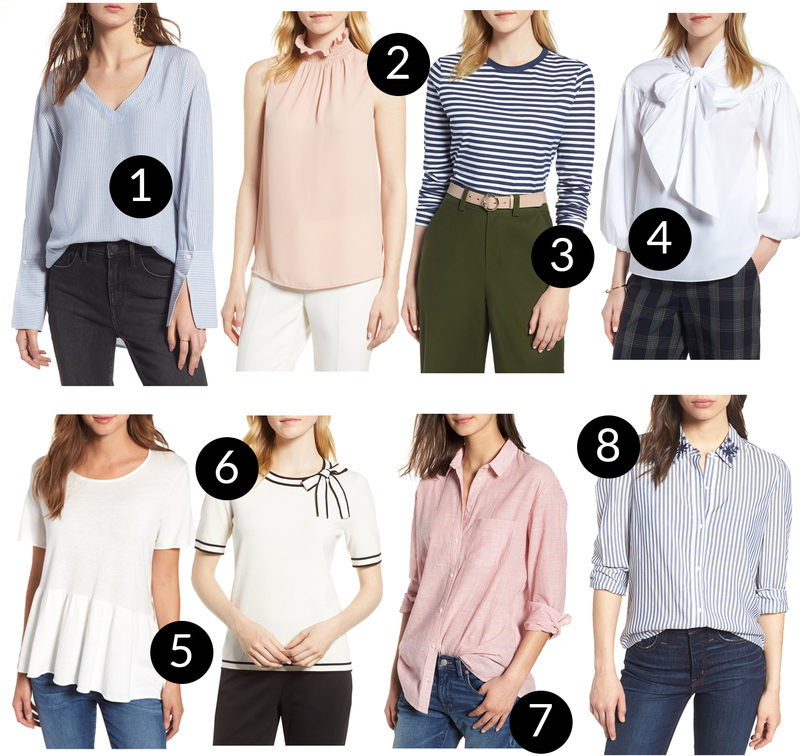 In my cart: You can’t go wrong with a navy striped basic, the bow top seems like a must, and definitely obsessed with this button-down. In my cart: SO EASY! This skirt, this maxi, and this scalloped number. Update: Mitch says the watch, the Bonobos blazer because he swears by them, and the Barbour. In my cart: This bathing suit set and this striped top for Emma! 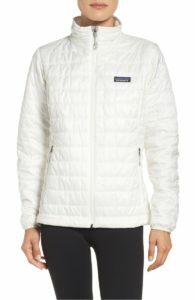 In my cart: This Patagonia so we can be matchy-matchy. And not sure if I can resist the bunny outfit. In my cart: LOBSTER SHEETS! And we have this blanket and adore it. Looks gorgeous and has held up, even with a toddler and destructive dachshund.